On Here We Go Magic's self-titled 2009 debut, frontman Luke Temple sang, on the album's closing vertiginous ballad "Everything's Big," "Eat like a cow, get fat like a pig." The venomous nature of the line was mitigated by the gorgeous instrumentation, as Temple sank his fangs into rampant consumerism and hedonism. On the act's fourth album, Be Small, parallels can be drawn to that six-year-old track, as the album finds Temple railing against carbon footprints and extraneous waste, while espousing an all-around more ascetic lifestyle. 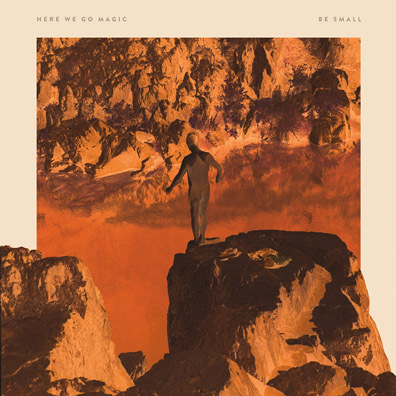 The instrumentation throughout Be Small is crisp and fulsome, sounding nearly as good as 2012's Nigel Godrich-produced A Different Ship, as Temple teamed with the other permanent member of Here We Go Magic, Michael Bloch, in his upstate NY studio to arresting results. Songs such as "Falling" and "Candy Apple" stutter and glitch with a Krautrock feel not dissimilar to the likes of Faust and Can, but Here We Go Magic's permutation is suffused with a pop acumen that fits Temple's lilting vocals like a glove. Temple's admitted an affinity for the John Cale/Brian Eno album Wrong Way Up, and that record's sanguine sonic imprint is all over Be Small.